I purchased this blush in Berry Bliss. The product contains 50% coconut water and Vitamin E rich Argan Oil. All natural ingredients which is good for your skin. The product is simply amazing because it's easy to blend. I use my fingers to dab on my cheeks and use a duo fibre brush to blend with. This is more of a stain which looks like a natural glow on your skin or it seems like you're blushing. The shade that I chose may look scary because it appears quite dark in the pot but it's actually the opposite. 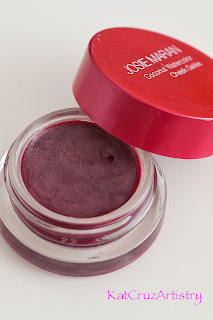 I was contemplating between this product or a creme blush but I prefer the texture and finish with these cheek gelee better than a creme blush because it gives a smooth finish, it literally feels like water on the skin, so there's no stickiness to it. This product is good for cold and humid weather places and it does last for a solid 10 hours. The only thing that I'm not too impress with is the packaging. The container or the pot is quite small that it makes it difficult to use a brush to get the product, like I said earlier I have to use my fingers to apply on to my cheeks but other than that it's a product that it's worth purchasing again. The price is a bit on the splurge side as they sell for $26 cdn at Sephora. I hope you find this review helpful.